Belmont faculty, administrators and research librarians recently hosted a mini-workshop and demonstration of innovative pedagogy session titled “The Scholarship of Digital Information” (SoDI). Sponsored by Belmont’s Teaching Center, the event was inspired by the New American Colleges and Universities (NAC&U) Digital Scholarship Workshop held at St. Edward’s University in Austin, Texas. 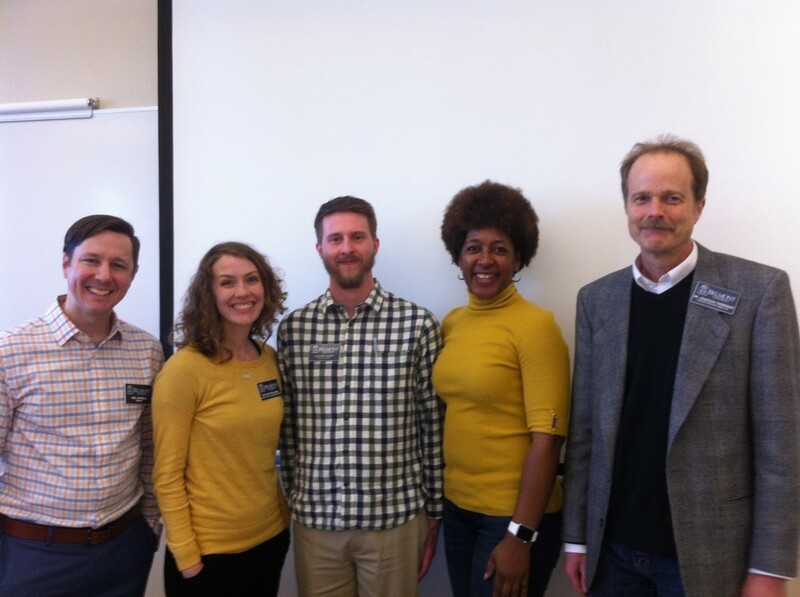 Attended by Assistant Professor of English Dr. Joel Overall, College of Theology and Christian Ministry Lecturer Dr. Beth Ritter-Conn and Professor of Media Studies Dr. Sybril Brown, the workshop provided ideas for Belmont’s Teaching Center workshop. More than 40 Belmont faculty and staff from a variety of disciplines including journalism, English, history, biology, pharmacy, entrepreneurship, occupational therapy, Christian theology, business management, accounting, music education, foreign language, and nursing attended. The mini-workshop was organized by Dr. Jonathan Thorndike, director of the Honors Program. “I knew that I was going to teach the French Revolution next semester in my interdisciplinary honors course, and I thought this would be the best way to get suggestions from experienced colleagues about designing a new assignment using digitized maps, texts, and images,” said Thorndike. Belmont’s Teaching Center workshop featured examples presented by Overall, Brown, Ritter-Conn and Zach Quint, research librarian. Participants viewed how technology, digital information and new ways to teach are converging and creating new insight into old sources like Shakespeare’s plays. Examples included using a Tagul word cloud, Google Earth digital mapping of literature, Kahoot game-based quizzes, holograms, Google + communities, Udemy courses, Mashable, Minecraft, Tumblr and many other technical upgrades to existing assignments. The Scholarship of Digital Information (SoDI) allows students and scholars to interact in new ways while building community and sharing information both locally and globally. SoDI is a new frontier for training students for careers involving information in business, natural sciences, humanities and computer science. SoDI develops skills to advance twenty-first century careers in education, archival work, media studies, librarianship, journalism, publishing and health record maintenance. Belmont students who are proficient in SoDI develop skills in digital curation, writing, content strategy and collaboration.